Talking about towns and cities is a common activity in both English language exam tasks, and in everyday conversation. Whether you’re verbally comparing and contrasting two pictures or writing an essay about the benefits of living in a city as part of a Cambridge Assessment English Exam; or, just telling a work colleague about a weekend trip to another town. Having a range of vocabulary for talking about these environments can be very useful. 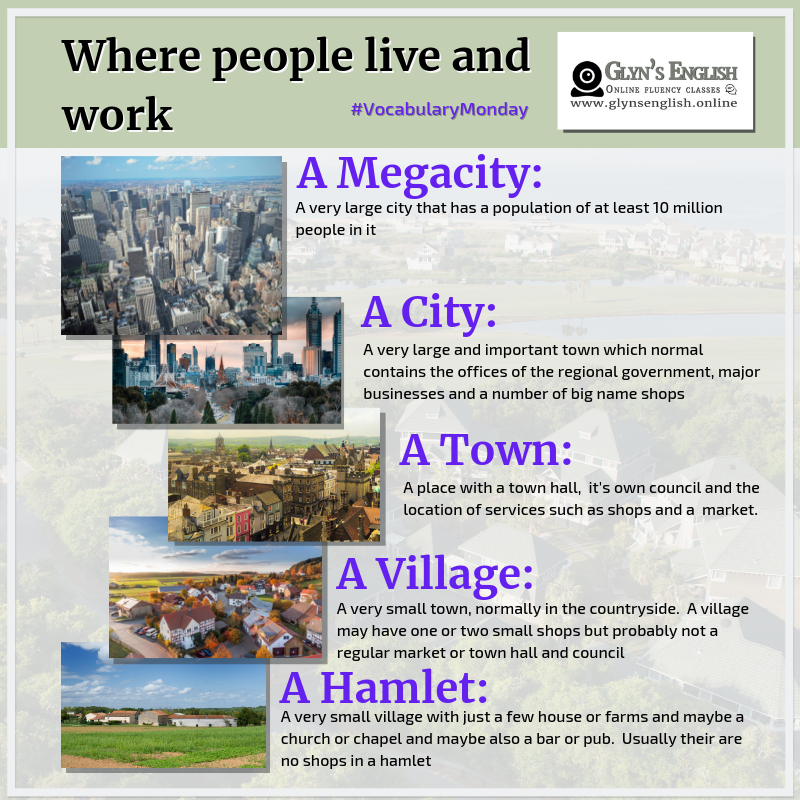 The common nouns that identify the size and type of place where people live and work are: Megacity, city, town, village and hamlet. A one-horse town: A town that is small, boring and unimportant. A ghost town: A town that is empty, where all the people have left, and nothing happens. The areas that a country is divided into with a local government responsible for them. Usually containing one key city, a number of towns and their surrounding rural areas. Noun (countable) – An area where many people live that is on the edges of a large city or town (outer-suburb) or inside the city or town but still away from the city centre (inner-suburb). 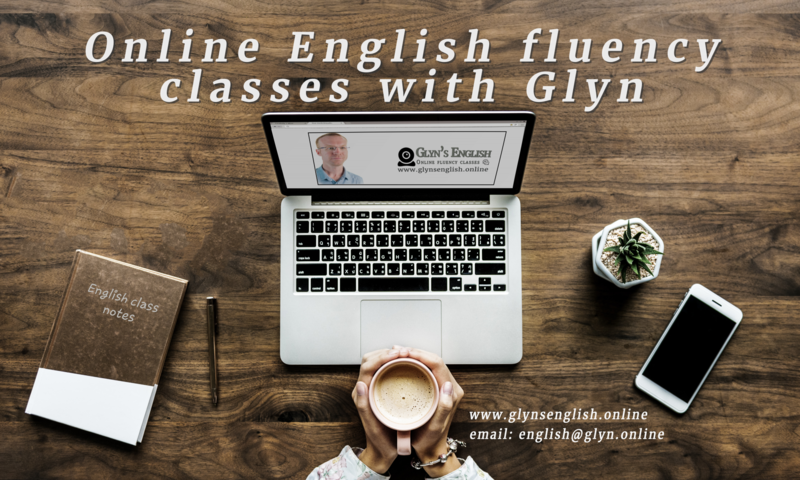 Plural Noun – More general and collective term for the areas and communities furthest away from the centre of a town or city . 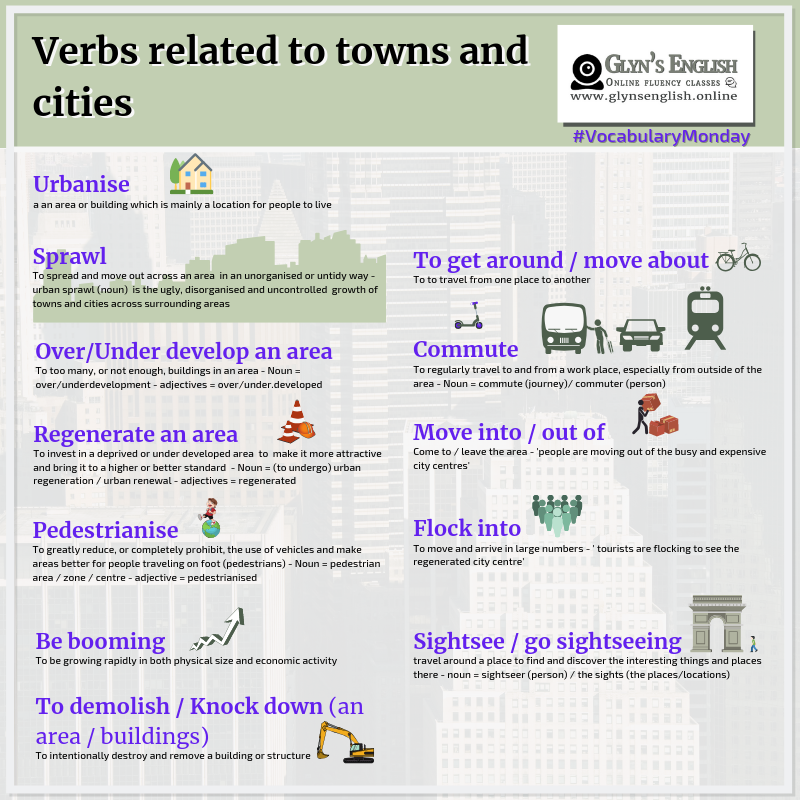 Noun – the areas surrounding a large city and from where many residents travel every day into the city for work (noun: commuters – people making a regular journey to work). 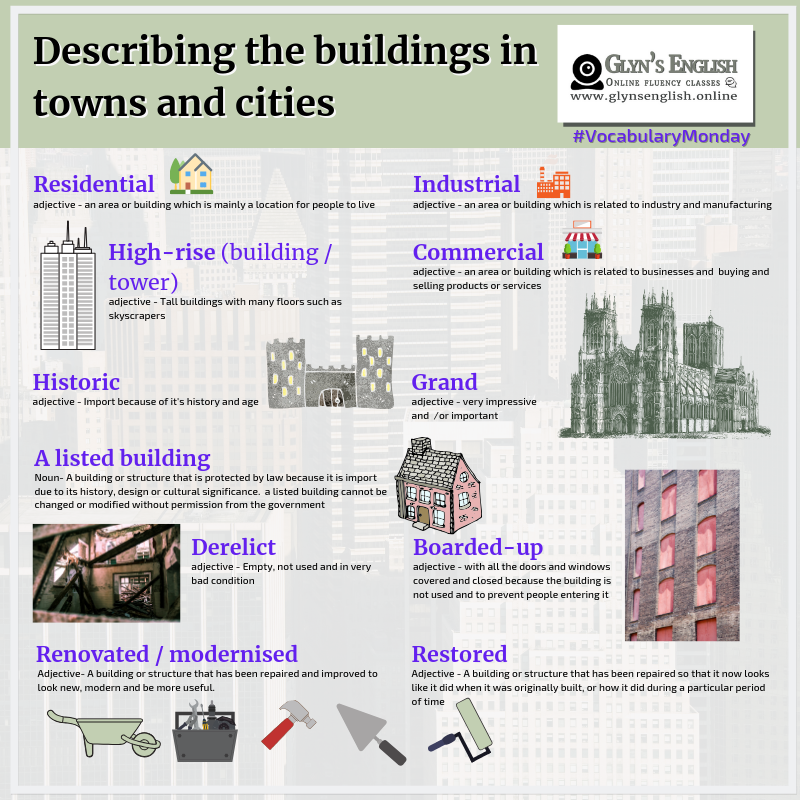 Noun and Adjective – the area of a city that contains the main shops and businesses. Also called ‘downtown’ in American English. Describing towns, cities and their areas. 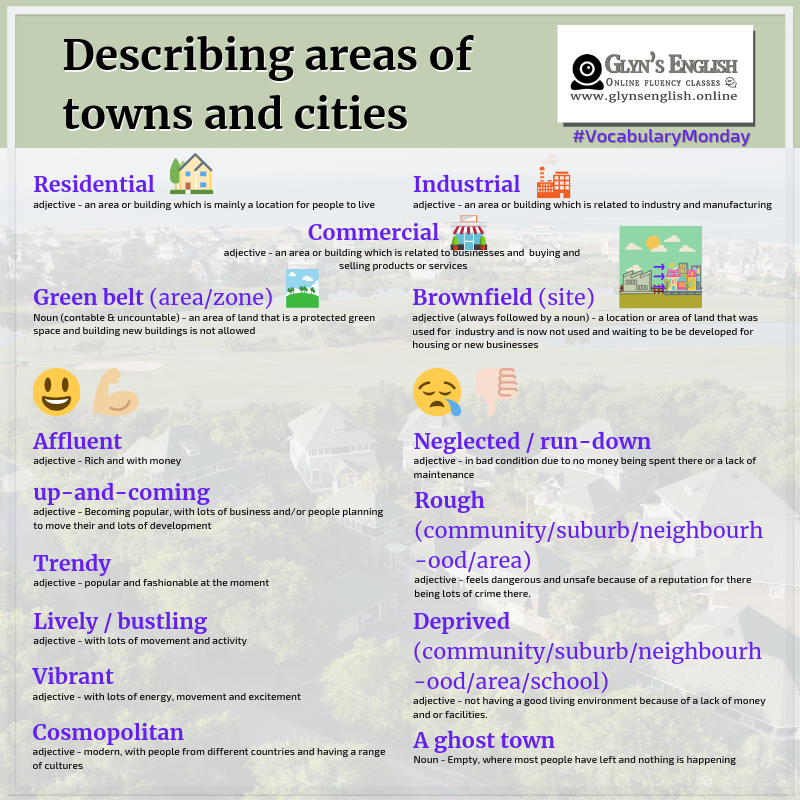 Now that we’ve seen some different areas of towns and cities, lets look at some of the more descriptive language we can use to talk about these places and their characteristics. Also, if you found this post useful or informative, then why not follow and subscribe to more of our content via our social network channels and streams using the links below.